How much time does it take you to fill out application? Laser App is an easy to use, interactive form system for the independent financial advisor. Laser app uses your broker, rep, and client data to assist you in filling out the tedious and redundant fields in securities and annuity forms. Simply choose an application from the program's menu and the form appears on your computer screen with client, rep, and broker information already inserted. The entire form is easily edited right from your computer screen! Have you ever noticed you are filling in the same name, address, phone, social security number and more? Laser App is a software program incorporating hundreds of application forms from mutual funds, broker dealers, annuity and insurance companies. The forms from varioius companies have been scanned in as images and can be populated using a single database. Using Act4Advisors to Laser App Interface, the form can be automatically populated with data in your Act4Advisors database. This saves you and your clients and enormous amount of time and frustration! Don't see your forms? You can have your forms added for as little as $25 per page? Get your wholesaler or home office to pay for it! Please Read: If you already own Act4Advisors and have purchased the Laser App Software from another vendor, you will need to purchase the Act4Advisors to Laser App Interface for $99. The Act4Advisors to Laser App Interface will automatically and properly place data from the Act4Advisors database to the Laser App forms without having to manually map each customized field to the forms. Saving you a lot of time! If you are thinking about purchasing the Laser App software from our website and currently own Act4Advisors, the Act4Advisors to Laser App Interface will be included for free. For more details please contact Sales 800-831-7636. 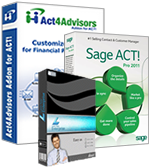 Act4Advisors, Laser App software, and Act4Advisors to Laser App Interface is included. ACT! 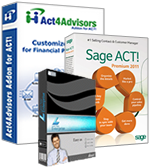 Pro, Act4Advisors, Scan&Organize, Laser App software, and Act4Advisors to Laser App Interface is included. Please Read: If purchasing 5 or more licenses of this bundled product, we recommend calling sales 800.831.7636 to go over details and to ensure proper licensing of all products listed in this bundle. ACT! 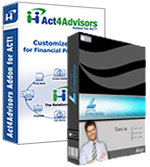 Premium, Act4Advisors, Scan&Organize, Laser App software, and Act4Advisors to Laser App Interface is included. 1. Requires a TWAIN Compliant Scanner. 2. 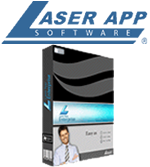 Laser App is a registered trademark of Laser App Software, Inc.
3. Published minimum system requirements are based on single user environments. Actual scalability and number of networked users supported will vary based on hardware and size and usage of your database. Sage Software scalability recommendations are based on in-house performance tests using the recommended server system requirements found at: ACT! Requirements to ensure your system meets these requirements. You must have one license of ACT! per user.